This is the ultimate resource for real estate investors and parents who wish to buy, manage and profit from rentals near colleges and universities. 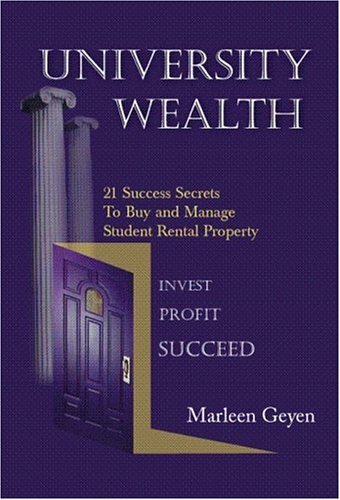 This 140 page book includes 21 success secrets on how to buy and manage student rental property. * How parents can have their university student live for free! * Why student rental property works for financial security. Finally, a teaching book on the nuts and bolts in the college rental area. A step by step proven process is outlined from locating, purchasing, leasing and managing student rentals. The author is a teacher, investor and the president of a company which specializes in purchasing and managing student rental property. Order your copy of this unique resource if you are a real estate investor or the parent of a college-age student who wants to profit by purchasing or managing properties near colleges or universities in your town or city. Only $24.95 for University Wealth. Free shipping. Click here.